Continuing on the small train of Tegami Bachi wallpapers...here's Gauche! :D Gauche caught my attention at the very beginning because...let's face it, he's good-looking! I loved everything about him--design, personality, colors, face...so on and so forth. But there are no wallpapers of him! Well, now there is one. The theme basically stayed the same; I should wean myself off those star brushes. I like them way too much, ha ha. I also tried something different and rather than English lyrics...they're in Japanese. Brushes/textures © Aethereality & Celestial-Star. Lyrics from "Remnants of Distant Days" from Love Will Grow. Thanks for another Tegami Bachi Wall! Nice Colors ! I love it ! *___* ! Thanks for sharing. I like it very much. This is a very lovely wallaper! I will definitely use it. ? Hmmm is he Guache or is he Noir? I love it. It is really nice. 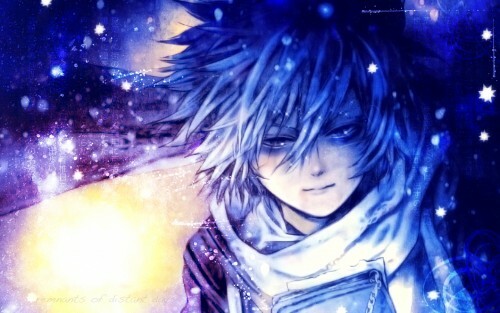 Tegami Bachi is lovely anime.